Please add topics you would like to see discussed to http://live.gnome.org/FoundationBoard/MembersAgenda. These topics will automatically appear on the meeting page at http://live.gnome.org/FoundationBoard/MeetingAgenda. The meeting minutes from our last meeting are available at http://live.gnome.org/FoundationBoard/Minutes/IRC20100130. Several months ago, people raised the issues of some inappropriate comments made during various talks. The board worked on resolving those issues, and then proposed the creation of guidelines to have better ways to limit such inappropriate comments, as well as to answer similar issues that would be raised in the future. We would like to encourage everybody who will deliver a talk at a GNOME event, or who will represent GNOME with a GNOME talk at other events, to go read those guidelines! Many thanks to Matthew Garrett for his initial work on this, and to the community for the feedback sent after we’ve published a draft of this document. Attended LinuxTag. Met with many people (some much more briefly than others). Claudia Rauch and Frank Karlitschek from KDE with Vincent Untz to talk about the Desktop Summit 2011. Ivanka Majic from the Canonical design team. Andrew Savory from the LiMo Foundation. Many of the Openismus folks. Ekaterina Gerasimova. David King. The new interns. Andre Klapper. Johannes Schmid and Vincent Untz about GNOME mobile and encouraging applications. Mario Behling who planned GNOME.Asia last year – he planned a barbeque for GNOME and many other free software folks at LinuxTag. Mark Shuttleworth from Canonical. Chris DiBona from Google. Dirk Hohndel very briefly. Jos Poortvliet. Jonathan Corbet from LWN. And many, many others. We had several GNOME talks during the Desktop track. (Mine was first on Saturday morning – not the best time for a talk!) And Frank Karlischek interviwed Vincent Untz and I for RadioTux. Worked on Annual Report letter. Worked on proposal to get more apps on GNOME Mobile. Attended Board of Directors meeting. Spent a lot of time with my bottom in an airplane seat. Voted in the GNOME Foundation Board of Directors elections! Had a million conversations (well maybe not that many), followed threads and kept up (mostly) with email. Too many different things going on for a short week. Organized a GNOME Roadmap discussion. Discussed copyright policy with team putting it together and adboard member with feedback. Discussed having a GNOME Mobile event at LinuxTag through WIPJam. Talked to Zonker about GNOME 3 press roadmap. Had some interchanges about GUADEC sponsors, logos, etc. I think all agreements are worked out except one now. Set up some meetings at LinuxTag. Met 1:1 with Brian and Rosanna (separately). 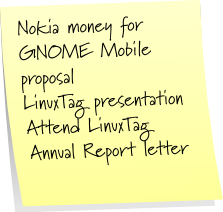 Get out board approved proposal for using the Nokia money for GNOME Mobile. Put together presentation for LinuxTag. Write opening letter for annual report. The GNOME Foundation is hiring a system administrator. Thanks to all of you who have made this possible! The GNOME Foundation is seeking candidates for a part-time system administrator position. The GNOME infrastructure cluster consists of a distributed network of machines providing services such as version control, bug tracking, web sites, and mailing lists to hundreds of part and full-time GNOME developers, and to the GNOME user community. The system administrator will work with and assist the volunteer GNOME sysadmin team to keep these services running smoothly, securely, and reliably, and to implement enhancements. This position is not primarily a coding position, however a certain amount of programming ability is needed to be able to maintain and enhance the system administration scripts and custom web applications that run on the GNOME servers. This position reports to the Executive Director of the GNOME Foundation. Be able to conceive and execute projects independently without detailed direction. Have experience working with volunteer and geographically distributed communities. Be passionate about Free Software and have knowledge regarding GNOME. Weekly and monthly communication with the Executive Director and quarterly reports regarding the Sysadmin Team’s work to the GNOME Foundation. There are no specific educational requirements for this position, however a typical candidate will have completed or be in the process of completing an undergraduate degree. Several years experience maintaining production servers is mandatory. To apply for this job, send your resume to board-list@gnome.org. July 25-30th: Follow up with top candidates.